From the moment we pulled up to Mount Airy Resort, we experienced a warm and welcoming hospitality. 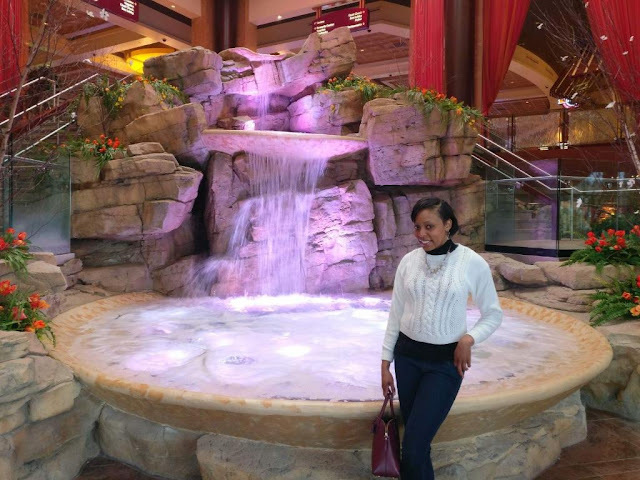 I was enthralled by the beautiful and extravagant cascading waterfall as I entered the resort. Once inside the stunning lobby, the staff greeted us, took our bags and seamlessly checked us in for our stay. Mount Airy Resort Casino is a family-owned property founded by the DeNaples family and located in the beautiful Poconos, PA. The resort offers 188 newly-renovated modern style rooms and houses a spa, a nightclub, restaurants and cafes, and a golf course. 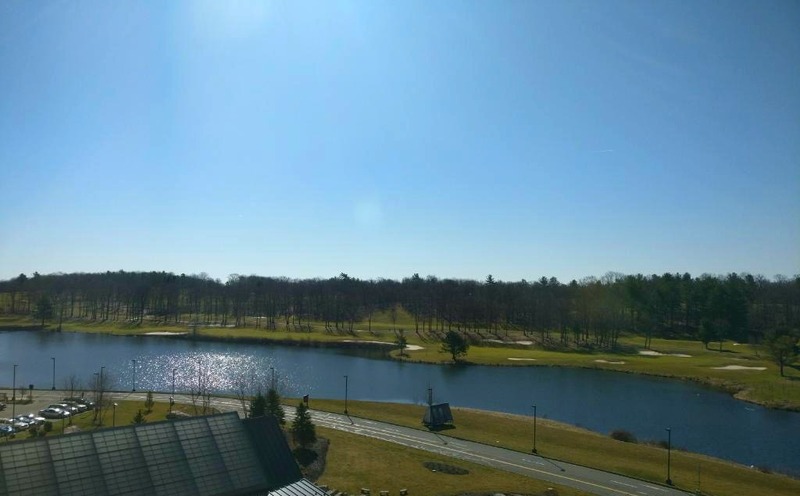 I stayed in a lake view room that looked out onto the golf course, which opens in the warmer months. Both Saturday and Sunday mornings, I stood by my window with coffee in hand taking in the view of the lake and the beautiful scenery before me. When you live in the concrete jungle of New York City, views like this one come as a reprieve. My spa visit stands as one of the many highlights of my stay. I was long overdue for a massage and looked forward to my spa visit following the end of a busy work week. It would be the first massage for my partner, and I shared in his excitement. 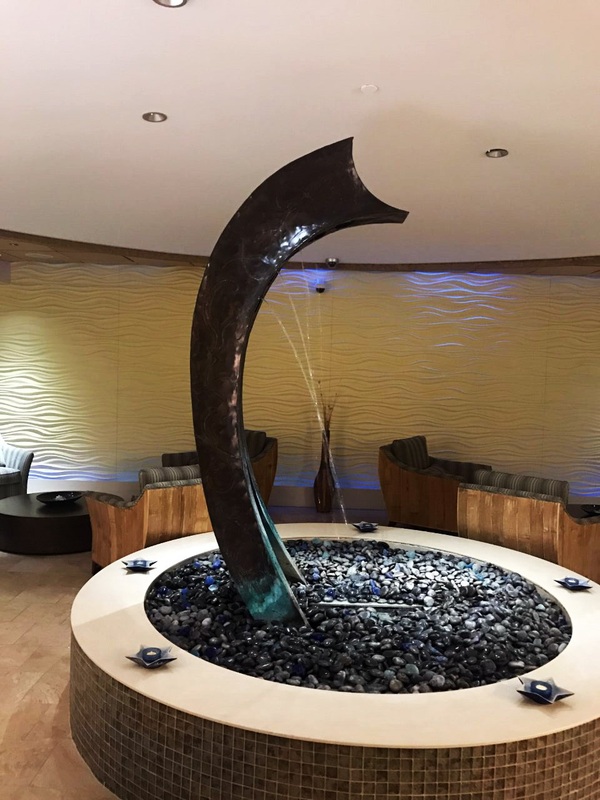 The spa ushered us into a relaxing Oasis. Upon walking in, you are greeted with a warm and friendly smile followed by the soothing sounds of a waterfall at the entrance of the changing rooms. The lounge area, lockers, shower, and sauna area are fully equipped with fresh linens, toiletries, and beauty products. I indulged in an hour-long Swedish Massage and can only describe this A+ experience as spectacular. Needless to say, my partner was so pleased with his massage that I’m sure it will be his first of many. The full-service spa offers massages, facials, manicures, pedicures and more. I looked forward to the yummy and hearty breakfast that we ordered to our room each morning. The resort offers a number of dining options including restaurants and cafes. We enjoyed a delightful meal at Guy Fieri’s on our first night. I recommend the tasty and filling steak dinner. 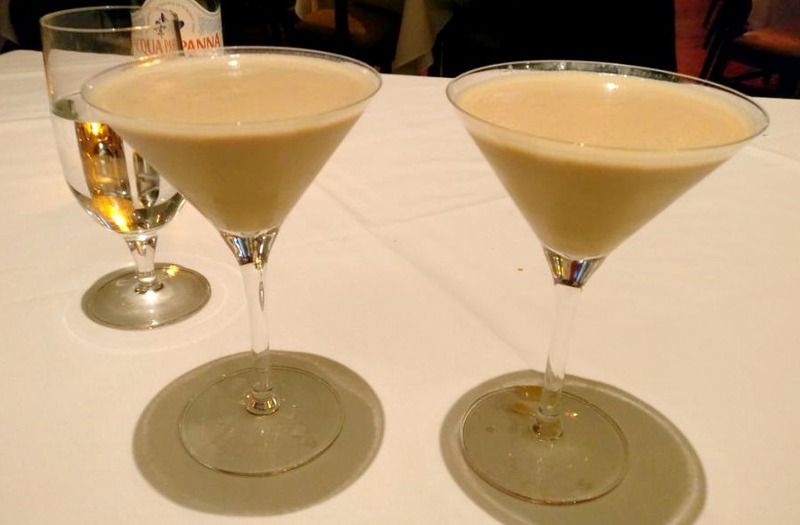 The following night we dined at Bistecca By IL Mulino, which was an absolute win. Since our first initial greeting with the hostess, we experienced nothing but phenomenal service and enjoyed the elegant ambience. We started our meal by ordering the mozzarella and arugula salad and Calamari. 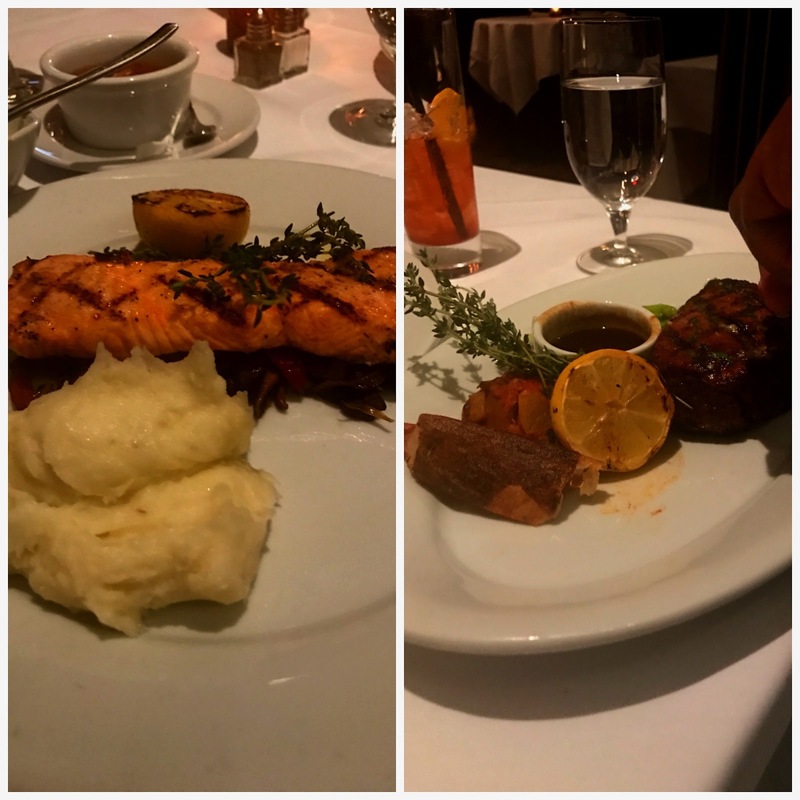 Next, I ordered a salmon dish and my partner ordered the filet mignon. Both were delightful! For dessert, our waiter suggested Espresso Martinis. It did not take me long to decide to order the martinis; coffee lover that I am! At the first sip, I thanked my waiter for an excellent recommendation. Martinis in hand we shared a delectable brownie topped with strawberries. During our stay at the Mount Airy Resort, we did not leave once, which speaks to the variety of activities to do at the resort. 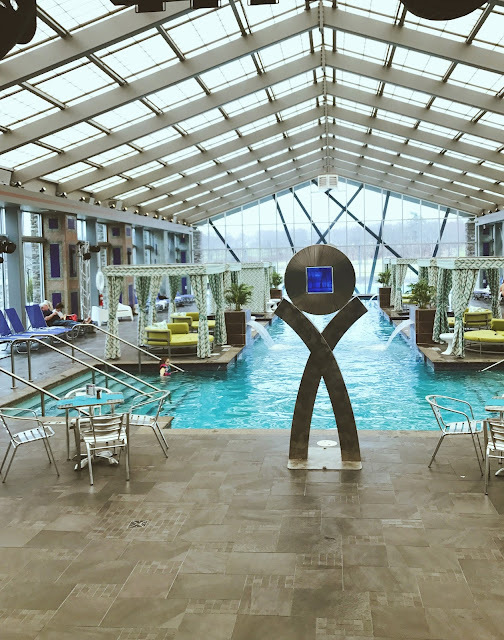 Along with the casino, spa, restaurants, there’s an indoor/outdoor pool, which I sadly did not get to enjoy. Definitely on my next visit! If you enjoy casino games, Mount Airy offers players the opportunity to earn points and move to higher tiers where they can gain a number of exclusive benefits. We learned during our tour of the property that Mount Airy houses a number of event spaces for both business and pleasure. While we danced our Saturday night away at the on-site nightclub Gypsies, we met a group of women who spent their day celebrating a bachelorette party. Beautiful scenic property, great food, an amazing spa and a number of fun activities, what more can we ask for? I would definitely recommend staying at the Mount Airy Resort on your next or first visit to the Poconos. 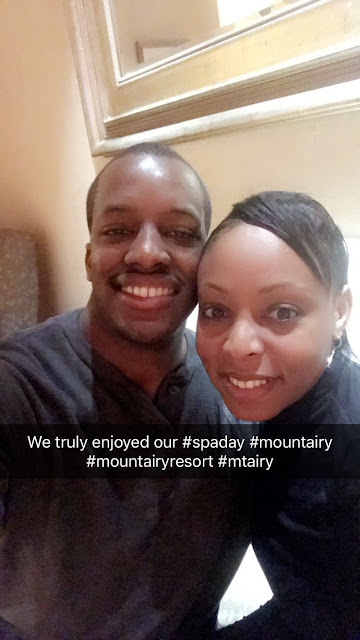 Check out this short video of our stay at Mount Airy Resort. Gabrielle Union has joined forced with New York & Company to bring us office chic style. I could not wait to view the collection, because as a working professional, I'm always looking for ways to add variety and flair to express my personal style. Plus, I've admired Mary Jane's work style since the first season of Being Mary Jane. Now that I've seen the collection, below I'm sharing a few of my top picks. 1. 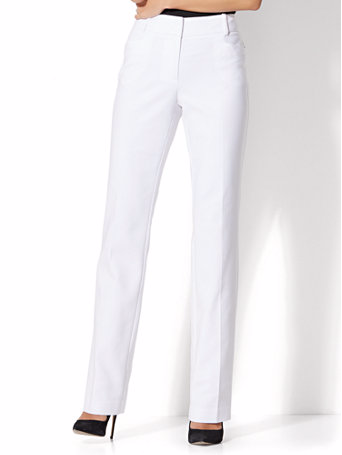 Pants available here - I love a pair of whit tailored pants in the warmer months. It's a sharp classic look. 2. Blouse available here. 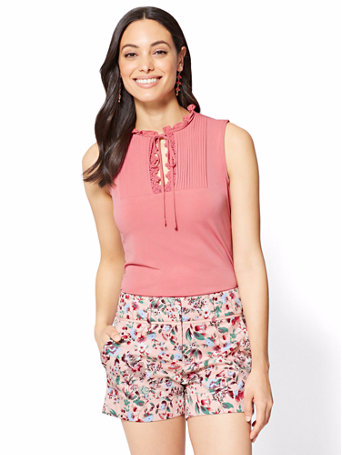 This is a pretty and feminine blouse. 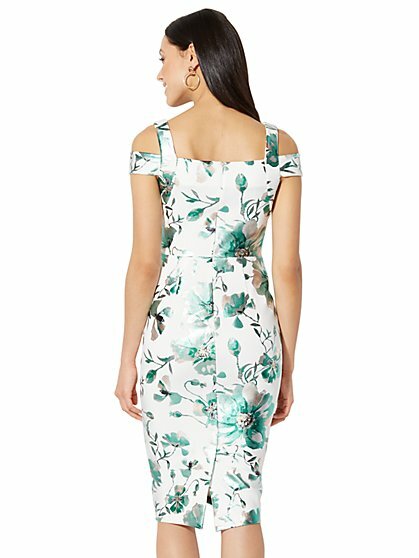 I would pair this with a pencil skirt. 3. Dress available here - This is a very Mary Janesque dress and it's my top favorite piece of the collection. 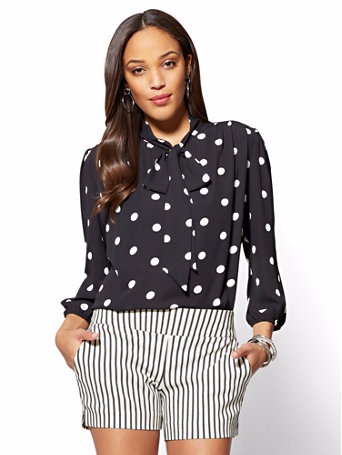 I would pair it with a cropped bolero blazer for work and wear it without the blazer for after work events. 4. Blouse available here - Such a pretty blouse for layering under suits. 5. Skirt - available here. I like the fishtail cut, this skirt is the perfect transition day-to-night transition piece. Have you seen the collection, what are some of your favorite pieces?